Pepper is one of the important herbs that have various medicinal properties. 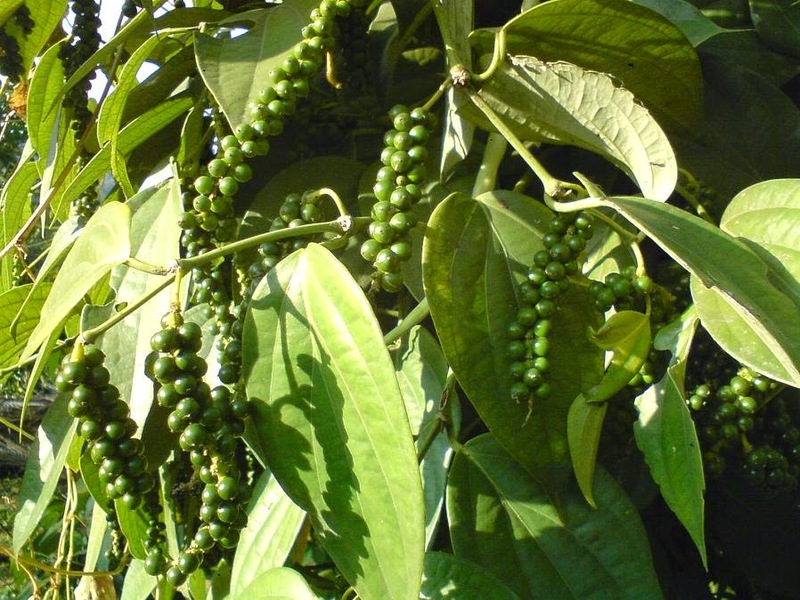 Pepper ( Piper nigrum ), is known to overcome various diseases such as arthritis, asthma, eczema, headaches, flatulence, cough, heartburn, and others. Pepper plants belonging to climb. The leaves are oval, single-stemmed, the location of the alternate or scattered. Grain shape, Pepper compound flowering, and hanging branch with the long ears of 3.5-21 cm, located on the tip or deal with leaves. Results processed pepper fruits can be divided into two types: white pepper and black pepper. Part used as medicine is a fruit. According to Prof. Hembing Wijayakusuma ( an indonesian herbal expert ) in his book Efficacious of Herbal Plants, chemical content in contained pepper are saponins, flavonoids, essential oils, poperanine, resin, piperiline, albumen, kavisin, starch, piperine, dihdrokarveol, piperoleine, piperonal, tran piocarrol, Kanyo-fillene oxide, kariptone, oil and pepper. The chemistry of pepper is spicy, distinctive smell, aromatic, and has a pharmacological effect as a laxative menstruation. 1. As an asthma medication, 10 grains of pepper, betel leaves 8 pulverized and then added 1 teaspoon of eucalyptus oil. Then stirred concoction smeared on the neck and chest. Drug eczema, 10 grains of pepper and 20 grams of Achyranthes aspera ( Heliotropium indicum ) pulverized and then add 1 teaspoon of lemon juice and whiting to taste. Potion stirred and rubbed on the affected part. 2. Overcome rheumatism, pepper, cloves, and young leaves starfruit and add mashed white rice vinegar to taste. Then applied on the affected part. Overcoming rheumatism, gout, stiff, brittle bones, pepper 5 grams, 5 grams of nutmeg, 1 finger cinnamon, cardamom 5 grains, 5 grains of cloves, ginger 10 grams, 10 grams of red ginger, 200 grams of red sweet potato, and brown sugar to taste boiled with 1000 cc of water until the remaining 500 cc. Then drink the water and eat the red sweet potatoes. 3. Flatulence, 5 grams of pepper, cloves 5 ​​grains, 5 grains of cardamom, 1 finger cinnamon, nutmeg 5 grams, 30 grams of raisins, 200 grams of red sweet potato, 10 grams of ginger boiled with 1000 cc of water until the remaining 500 cc. Water to drink and eat sweet potatoes. 4. Overcoming headaches, 1 teaspoon pepper, 15 grams of leaf willow, and 15 grams of crushed ginger and add 1 tablespoon of eucalyptus oil. Rub the neck and back. Do it once a day. Other ingredients, 5 grams of pepper, cloves 5 ​​eggs, 5 grams of nutmeg, cinnamon and 1 finger dried and ground into a powder. And brewed with hot water and warm while drunk for headache medicine. 5. Whooping cough, 5 grains of white pepper, 1 turnip, and two tablespoons of honey steamed, then eaten. Heartburn drug, 5 grams of pepper and 1 pear boiled with water, filtered and add honey to taste and drink the water.